The "auto" margins position the div itself, not the contents of the div. If you want the buttons centred then use text-align attribute. You seem to be regressing on this problem. A while ago you have a form with a timer that submitted to a database update. 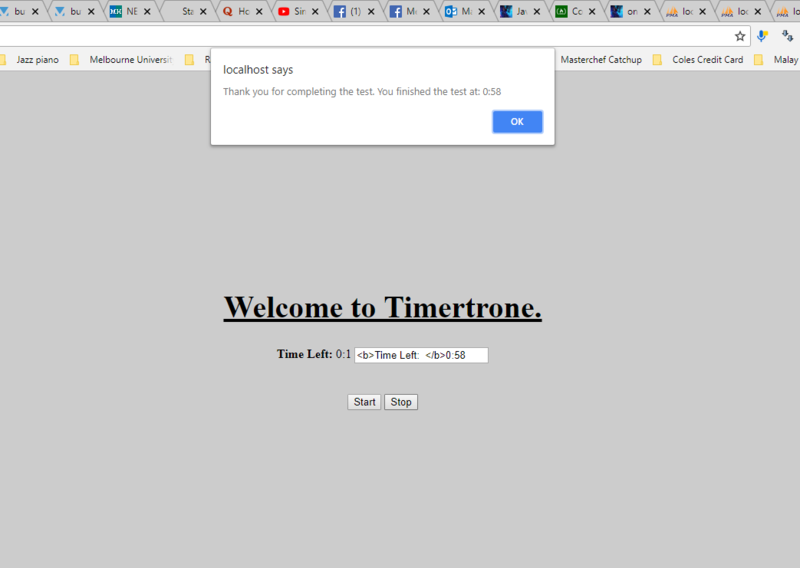 I did but that was a countup timer and i have found a countdown timer but for this particular one, it doesn't seem to work when i put a form tag. I think it could be the span element? The code is likely built to navigate that page with specific tags within a specific order. What does your code look like? Preferably the code that's specific to the problem. I'm not sure how much code there is. Thanks for the reply.. the code is as follows. I am trying to have a form so that i can update it into the database. 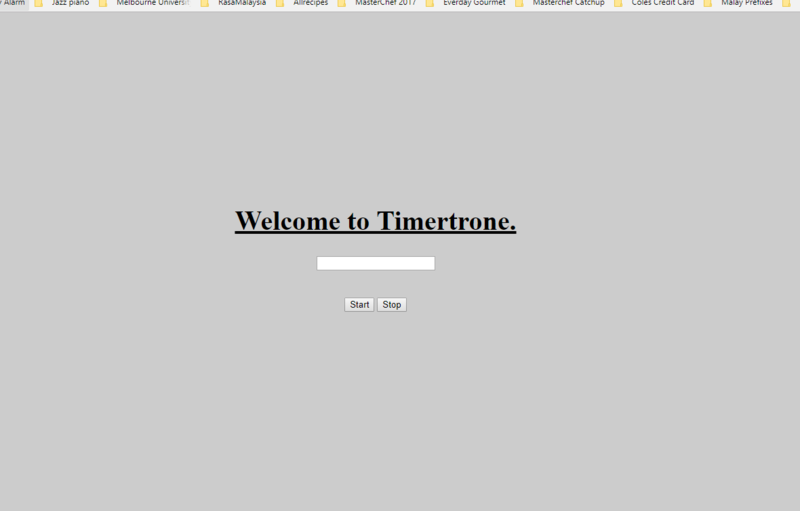 But the timer doesn't work with the following code..
Also, you've got an empty h1 element and you don't have the '>' at the end of your </form> tag. But the timer doesn't work with the following code.. I am trying to have a form so that i can update it into the database. Yeah, that would be a reason for using a form. Does that mean you are trying to record the interactions with both the Start and Stop buttons? If so, you could pass the information to PHP using AJAX. That way the page wouldn't need to reload every time a button is pressed. This is not the code that cyberRobot was talking about. I have to assume there's a startTimer() and stop() function somewhere? When I change the function name to "stopTimer", remember to change the function call in the <button> tag also, the script magically works again. Did you try the script I posted yesterday. You have so many current threads about this same page problem you may have missed it. My apologies Barand, I can't believe I posted in different places.. I must have overlooked! In your code, can I add a submit buttons and a form tag ? 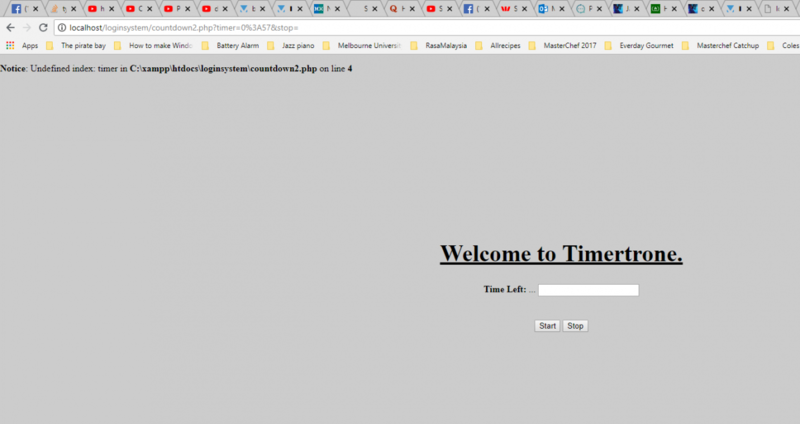 I will try to see if that will process the variables in php with a form tag.. You guys should make some video tutorials as some people may be more of a visual learner.... but thanks! Barand, why did you use a form name="form1" because I can't see this in any of the functions? Apologies... I see it.. I might have asked this before but should I be storing the value: 00:00:00 as time or timestamp? I guess timestamp is for date where you have the days as well but for time, it is just time? and I don't have to explode and remove the : to store it I guess? Why don't you check what the mysql manual says about it?